BlackBerry Discontinues Iconic Original Keyboard, Ending Classic Model Phone : All Tech Considered BlackBerry says it's discontinuing the final model that has the traditional clickety keyboard and trackpad — darlings of government workers, businesspeople and early episodes of House of Cards. 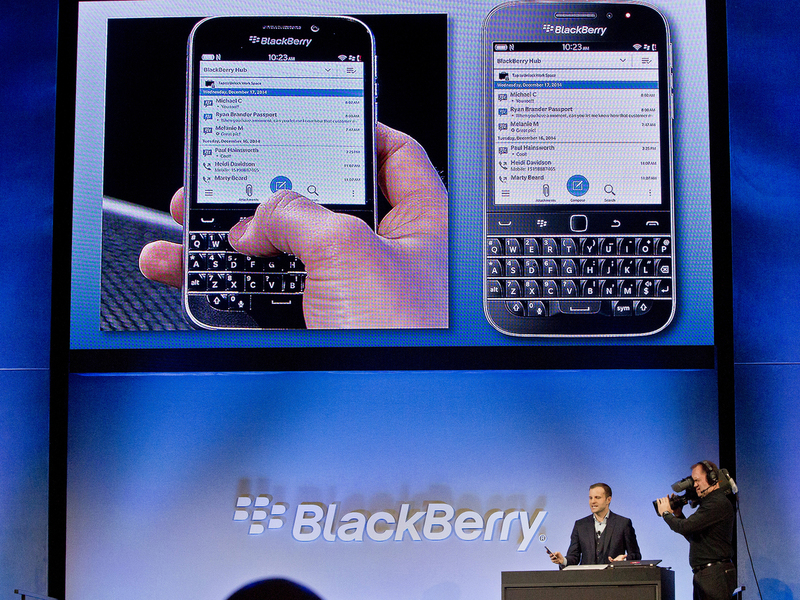 BlackBerry's Director of Marketing and Enterprise Jeff Gadway demonstrates the BlackBerry Classic during a news conference on Dec. 17, 2014. The days of peak BlackBerry in the U.S. capital are hard to forget. The swift clackety-click of the keyboard and the soft trrrrrrr of the trackpad scroll invaded every corner of Washington: You'd hear it on the Metro and in building hallways, at dinner tables and in bars, in elevators and, yes, even bathroom stalls. OK, it wasn't just D.C. actually. For a while, everyone seemed to have a BlackBerry. Frank Underwood. Kim Kardashian. Everyone. The true "crackberry" craze phase has subsided over the past few years as BlackBerry's smartphones lost out to iPhones and Android devices. And now, BlackBerry is bidding farewell to its Classic model, the final bearer of the original, signature plastic keyboard. "Sometimes it can be very tough to let go," BlackBerry Chief Operating Officer Ralph Pini wrote in a blog this week, announcing the decision to stop making the BlackBerry Classic. "The Classic has long surpassed the average lifespan for a smartphone in today's market," Pini wrote. "We are ready for this change so we can give our customers something better — entrenched in our legacy in security and pedigree in making the most productive smartphones." The Canadian company has been shifting away from consumer devices toward software and other products for businesses, even forgoing its own smartphone operating system in favor of Google's Android. "Clearly eyeing an older business crowd that missed the precision of a keyboard with actual keys and sturdiness of the old phones' black synthetic material, the company made a leap to see if there was a market that it was missing. "Suffice it to say, the market wasn't there." But go ahead, reminisce with me. Annoy people around you by enabling keyboard sounds on your smartphone and pretending it's a BlackBerry. (Spoiler alert: It's not as satisfying.) Throw back to 2009 by installing that classic BlackBerry ringtone, that's now so eerie-sounding courtesy of House of Cards. Or get your fix by listening to a stranger silently tappity-tap on those keys. Thanks, Internet.